Preschool Playbook: Did They Dry? 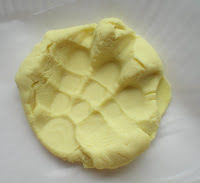 If you read yesterday's post, you might be asking yourself, did those eggs dry? That's what I kept asking myself all day yesterday. They did! Yeah. There were a couple that were still damp on the bottom, but for the most part they were good. Today we had to add the second coat of newspaper. I will tell you they had a little trouble with this. Yesterday, they could see the balloon and understood that they were to cover the balloon. Today I explained we are going to make the egg a bit stronger so it doesn't break easily. We have to cover up what we did yesterday. They kept saying, "But I'm already done." A few of them did okay, but for the most part each child picked one section to add about 5 pieces of paper. These ones should dry real easily. If you're wondering. The glue was still usable, but I would NOT use it another day. It actually smelled like we were baking bread in the back room. The kids kept asking where the dough smell was coming from. The glue was also a bit thinner than when I did it at home. Maybe because it was a different type container? It still worked. 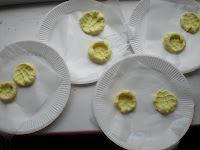 Our other activities were fossil footprints and stamping. 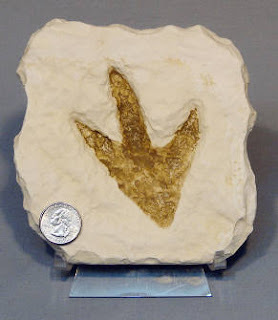 I am always completely amazed how they adore doing the fossil footprints. 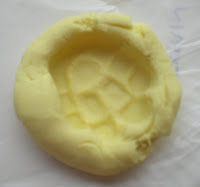 I just give them some play dough to roll into a ball and we press a meat eater's and a plant eater's foot into it. They love it. For the stamping they drew a little background scene and added some dinosaurs with stamps. 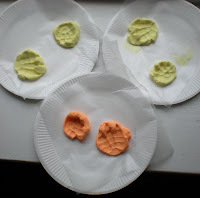 This is an easy activity, but the children love to stamp. The book we read was an adorable Little Critter book, "The Lost Dinosaur Bone," by . 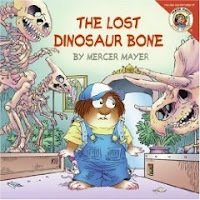 It is a cute little story with Little Critter visiting the museum and helping to find a lost bone. The children really enjoyed it. Simple yet effective. Oh yeah, you remember how I said I had tons of boys? Well, do you know what the Good Lord decided to send our way today? Rain! How dare He! Doesn't He know these little guys need to run out some energy? :) I actually think He does know it. I awoke to rain which stopped about 8:15. I got to the school and wiped the playground down and we were okay. We had a few drops, but a little water will just help us grow(hopefully not me too much!). Oh Trish, this is about the neatest project ever!!! Well until you show me the next one, LOL! this is great. i love that you are doing projects that take more than a few moments! I can't wait to see how those eggs turn out.... I'm so curious. They look great so far! I'm loving the stamping project. That looks like a lot of fun!